Outstanding. Let's hope it lives up to the hype. Because he is a MultiKultist, like most Christians, and he knows that the future of Christianity is with mud people, not Chalkies. Too bad most Chalkies don't realize that themselves, and reevaluate their loyalty to Jebus. It was such a weird coincidence! Rosie was rummaging through the dumpster out back of the Golden Corral, and Ivanka was behind it blowing the Heeb who owned the joint (as she is required to blow every Jew in the Kwa with a net worth greater than $100,000, per her daddy's NWO service contract). “The Nazi’s did not intentionally gas six million people, I do not accept that,” he is heard saying before being shouted down. Garrett and the reporter are immediately surrounded by other Trump supporters outraged at the interview. The Alt-Fag and White Whateverists do not understand what motivates the Trump movement they are trying to coopt. For the 1,000th time - the Overton Window has not shifted. Trump pulled back the curtain the Republican establishment used to cover part of the window. The union of Trailer Park White Trash and Frightened Geriatric Chalkies that back Trump is fundamentally a populist revolt of dog-whistled Republicans. It is not an awakening of White racial interest. These people are not racially awake, they do not want to be racially awakened, and they lurv kikes. These people are sheep, as I warned the Trumplings. They follow Trump because he is a billionaire reality TV presidential candidate. The evidence is staring you in the face in this video. These people are not awake. They are still filled with the MultiKult poison, and will do as their celebrity mischling-grandpa tells them. Look at how they single out the lone dissenter (10:00). The herd is being shown who not to be. That's what the Mass Media has been doing for decades, pointing to White Whateverists and saying - don't be like him. Can't you see? Even if Trump gets elected, the masses are still poisoned against their own interests. Even a crowd of Trump supporters can be made to applaud coexisting in a Multicultural society [...] Please accept it Trumplings - Trump's sheep will not become your flock. That paragraph was originally posted in response to Trumps softening his immigration rhetoric back in August. But isn't it interesting how well it fits with the video linked at RawStory? I've never heard of the Chalky useful idiot in this story. If he is a plant, I thank him for inadvertently exposing how racially unawake the Trumplings are. If he is not a plant, I hope he learned something after being turned on by the "average Trump supporter". 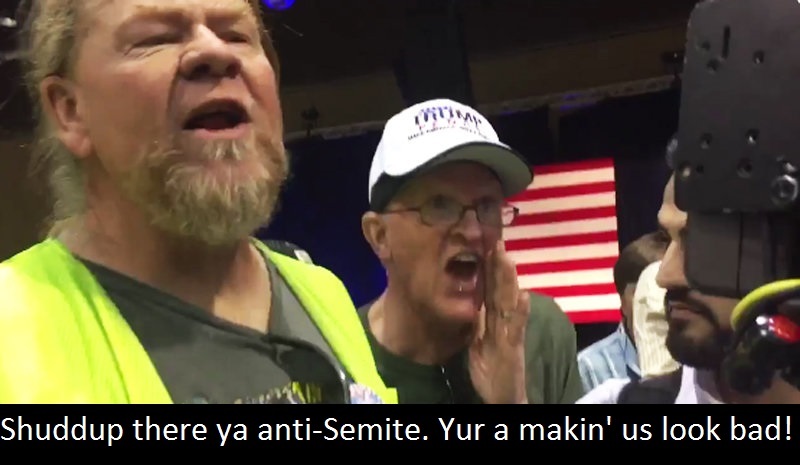 It is pretty sad that these Trailer Dwellers better understand the meaning of Trumplingism than someone who is allegedly racially awake and Jew wise. In my experience, the sub-apes are primitively religious, and quite superstitious. The females are much more so than the males. The females truly believe that Black Jebus is involved in the minutiae of their lives. It is amusing to me that you brought this up, because coincidentally, a groidess at work today very excitedly told me how Jebus had helped her find some money she lost before she could deposit it in the bank. She said she had told Jebus, "I know it isn't lost, because you know where it is and can bring it back to me." I smiled beatifically while she spewed her ravings. If you're right, these young Trumplings will be like the Ron Paul obsessives from 2008. Fools who imagine themselves awake, but who end up doomed to hopelessly wander every crackpot corner of the interwebs.